Clark County Law Foundation's (CCLF) Let Freedom Ring Art Contest provides a wonderful opportunity for students to learn about our legal system, justice, get creative and win prizes. The contest can be incorporated into a curriculum, offered as extra credit, or just done for fun. The Let Freedom Ring Art Contest is open to students attending a public, private, or charter school, or being home schooled, within Clark County, Nevada and in grades K-12 or the equivalent. Only original individual submissions are accepted. The 2019 Let Freedom Ring Art Contest theme is: "Free Speech, Free Press, Free Society." The First Amendment of the U.S. Constitution guarantees freedom of expression by prohibiting Congress from restricting the press or the rights of individuals to speak freely. 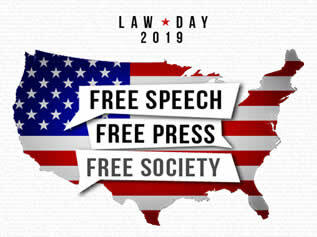 Not only in the United States, but around the world, freedom of speech and the press are prominent topics in public discourse and litigation, and changes in technology have reshaped how free speech and free press work in the everyday world. Historical and current debates surrounding free speech and free press continually challenge us to consider their boundaries and resilience. This theme calls on us to understand and protect the rights of free speech and free press as fundamental to our constitutional purpose and to consider how our governmental system is working for ourselves and our posterity by asking participants to reflect on these questions: What is the role of government in regulating or protecting speech and the press? Should speech or the press be constrained through laws or norms? Participants are encouraged to use their creativity and originality to make a two-dimensional representation of an art piece (including, but not limited to, drawings, paintings, videos, photographs, graphic novels, comics, etc. ), exploring the protections afforded to all of us by the First Amendment of the U.S. Constitution and why the preservation of these principles is essential to our liberty. Please note that two-dimensional artwork should be no larger than 11" x 17". All qualified participants under the age of 18 must have their parent or guardian sign the Parental Permission Release Form, and each Let Freedom Ring Art Contest Entry Form must be signed by an adult. Participants will be competing for recognition and awards in grades K-5, 6-8, and 9-12. Runners-up receive prizes with a value not to exceed $100.00 and winners will receive prizes with a value not to exceed $250.00. Awards and prize will be presented to the winners and runners-up as part of CCLF's annual Liberty Bell Award ceremony at the Historic Fifth Street School at 401 S. 4th Street in Las Vegas, Nevada on Saturday, April 27, 2019 at 11:00 a.m. Other notable submissions will be on display at the ceremony. The public is invited to attend.